The Kava Tincture Plus contains 1oz of highly concentrated kava extract. Just 40 drops twice daily are all you need to enjoy the stress free benefits of Kava, without the mess and tedium that comes with preparing kava drinks. Kava is commonly known to be an aphrodisiac in the country of its origin and naturally supports relaxation and stress relief. * In our independent surveys, our Kava Tincture Plus has been shown to help reduce anxiety and increase well-being, especially when used over a period of several months. Now you can enjoy your Kava in an easy-to-use Kava Tincture Plus, with a 6% total Kavalactone concentration, and a delicate flavor that will not overwhelm. This organic full spectrum Kavalactone extract is crafted from the highest quality farmed or sustainably harvested Kava root in pure grain alcohol. Full spectrum extracts. Hand-crafted in small batches. Infused with pure passion. 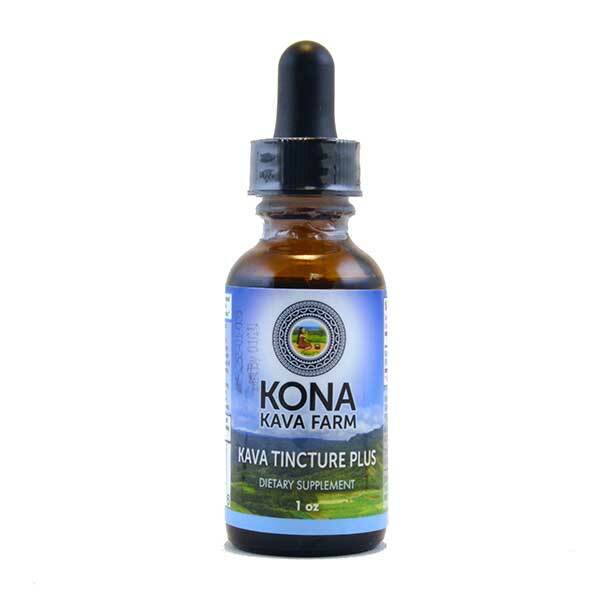 This is our Kava Tincture Plus, which boasts a 6% Kavalactone concentration. Ingredients: Liquid extract of Kava root, at approximately 6% total concentration. Thank you for your question. The final ingredients in Tincture Plus are Kava Root Extract, Grain alcohol (30%), Glycerin, and purified water. How many doses are in a 1oz bottle? There are roughly 15 doses in a single 1 oz bottle of the Tincture Plus (6%). 40 drops is one serving. This, along with the 33% kavalectone powder, has been my first experience with kava. I found the tincture to be an effective remedy that eases the mind and relieves stress and anxiety. As a fairly large individual (I weigh approx. 220 lbs), I found that the dosage I required to feel the effects of the product was larger than the recommended amount. Since I was using the product only once a day (as opposed to the two times suggested on the bottle), I increased my dosage to 1.5 times the recommended amount. Although this was a sufficient amount for the product to have an effect, it also meant that I went through the bottle rather quickly. All in all I found the product to be useful and effective, however, a lower price would certainly make it more accessible. Thanks for the positive review! This is one of the Kava products we’re most proud of, so it’s always awesome to hear from a happy customer! Wonderful for Instant Anxiety Relief! I use this tincture as an quick and easy anxiety relief. It’s wonderfully relaxing after just a few minutes, and is easy to carry with you when you’re on vacations, etc. My personal go to sleep remedy is the cocoa instant kava drink mix in a cup of milk, instant breakfast drink, and a dropperful of this tincture. Helps me relax and sleep like a babe! Thanks for taking the time to share your experience (and recipe)! Kava for anxiety relief is one of our favorite uses as well. We’re all pretty relaxed around here, but when things get a little stressful, nothing beats a fresh Kava drink with the added kick of some of our Tincture Plus. Glad to know it helps with restful sleep as well; that’s one of the great things we hear from satisfied customers time and time again. Enjoy! Can anyone speak to this kind of kava for anxiety and help with restless legs or a different kind of kava for this? Awa Calm is a particularly potent variety of kava that we have formulated to provide maximum relief from anxiety and stress. If you have any further questions you can give us a call at 760-989-5577. About how many doses are in one bottle? There are approximately 15 doses per tincture bottle. This is my first purchase of a tincture. This works so well after a crazy day at work or before bed. Highly recommended. I need something to really relax my mind. I mean really relax it. Do you feel that this product would do just that? My days are so full that a few minutes of mental relaxation would be amazing. You can use this alone or add it to your brew for a stronger drink. I have bought this several times! One dropper full relaxes, two prepares you for sleep. Excellent for anyone who doesn’t have time or doesn’t want to brew kava drinks. Love this product! Excellent product for my first purchase! This was one of my first purchases from this site. I was very pleased with this product. The potency of this tincture was great! It is a quick way to unwind after a long day at work, or even as a supplement to add to your kava drink for an extra kick! A couple of dropper fulls before bed also help me slee through the night – which is great if you’re an insomniac like me. I would highly recommend this product! Absolutely love this site and company! Customer service is also top-notch. I’ve never had a more pleasant experience with a site before in my life! Thank you for the great review! No matter how much feedback we get here at Kava.com, great reviews always give us a jolt of positive energy. We look forward to being able to serve your Kava needs better than anyone else! I am pretty new to the world of kava, but this product surpassed all expectations! I would recommend this to everyone! Great! Theres nothing that we love more than introducing people to all the amazing benefits of kava.